After lots of humorous, diplomatic interactions, or at least as diplomatic as the straight-forward, take no crap Carol Danvers can be, the throw-down is finally here. DeConnick does a solid job of tying a neat bow around loose storyline paths that have been dangling throughout the last six issues. The non-linear story telling style from previous issues may have created confusion more than suspense for some readers, but here all those issues are dealt with. A few of Danvers adventure party are given good character moments that provide emotional support. The idea of an entire group of rebels standing up to their exploitative colonialist rulers will feel familiar and empowering to American history’s buffs as well. The big difference is that their most powerful way of standing up is having Captain Marvel as their champion. Between massive battles and big explosions Lopez art feels more detailed in this issue than it has been throughout the arc. The colors also pop and are more distinctive, less muted or layered. This brilliance helps to create a powerful punch and get the adrenaline pumping as the destruction of the mine, at the center of the controversy, is about to meet it’s doom. 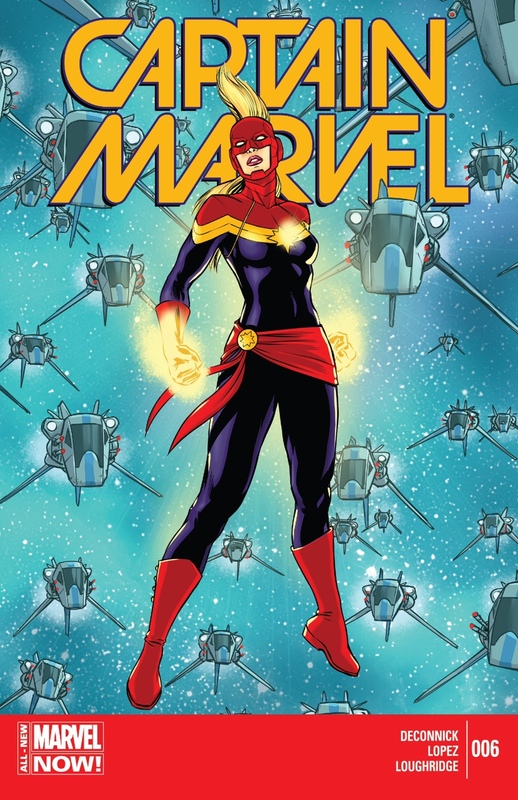 This creative team was given a early impossible task of living up to the awe inspiring conclusion of Volume 1, which also served as the peekaboo introduction of Ms. Marvel. While it will take a feat of inspiration genius to top a storyline like that, the team has done a solid job of showing what Carol and the Carol Corps (anyone who is helping and supporting the Captain at the time) are all about: family, freedom and acceptance. This time the action has simply been transferred off Earth and onto a foreign world and into space; hopefully pushing people slightly out of their comfort zones. By pushing readers to care about groups different than themselves hopefully it is helping readers to also care and accept their fellow human beings who may not fit within their “normal” personal parameters. It seems like a lesson our whole country may need to be reminded of from time to time. The long awaited conclusion to the interstellar mission Carol set out on in issue one wraps up here with a massive battle, some light humor and emotional heartstring pulls.